Design is not in-your-face art always. It is usable, subtle and sometimes undefinable. In simple words, I can say that good design is often “invisible”. To be clear, invisible design is not related to adding transparencies or layers or some hidden meaning to web design project. It is about developing highly user oriented designs that work visually and functionally. This is something I got to hear quite a number of times when I started as a young designer in web design Brisbane. If you are supposed to “decorate” the canvas, you are over-designing it. The best design that really makes a site work, is invisible. How to explain invisible design and how to achieve it? Especially when the web design is a visual tool. Much of the design is about “feeling good”. Users or visitor want to interact or engage with something they value. They might necessarily not understand why. That’s an invisible design. Though the idea had been crushed in my mind before I heard Oliver Reichenstein, director of Information Architects, emphasizing the concept of invisible design. In his interview with The Verge, he stated that great design is invisible. Good screen design occurs in the subatomic microtypography level (the exact definition of a typeface), the invisible grid of macrotypography (the way typeface is used), and an invisible world of design and information architecture interaction. Least input, biggest output with minimal conscious thought is what the screen designers emphasize on. And just as kind engineers and designers we don’t try to have an ideal solution but the best compromise. 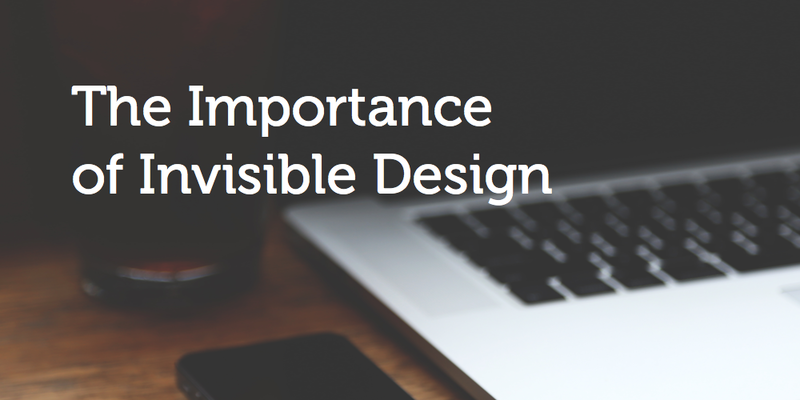 Why Is Invisible Design Important To Understand? When you develop a mobile app or webpage or even the interactions for the smartwatch, you design some kind of communication. Your design must support the message and not become a hindrance in the way of it. You will develop an experience with all the design tools at your disposal. The final design is not for you, but for the wider audience that is unaware of color theory or typography or spacing. They just know your message if these things arise together in cohesive, interesting and usable way. Hence, it is important to think of design as an invisible tool. Invisible aesthetics are deeply rooted in the design theory basics. It is not an application or a trend of a cool latest UX feature. It’s applying color, text, icons, techniques, images and typography to deliver a message. After studying the concept of invisible design, I came to conclusion that says that design simply and with clear purpose. Don’t embellish it with trendy components just because you want to use some techniques. Design little pieces so that they work smoothly. Design the big picture to paint a complete image of what your web design is supposed to reflect.